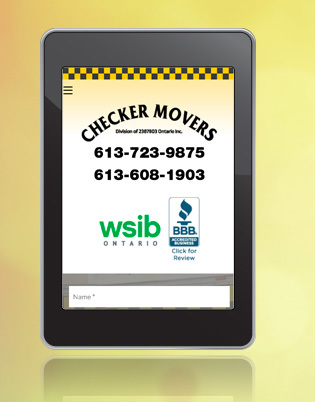 NDDesign took on the challenge to re-vamp the website of Checker Movers in Ottawa. One of the first changes we made was to design a mobile responsive site. Starting in 2015, Google has been making mobile friendly websites easier to find. Secondly, we thought about Checker Mover’s ideal client and what they would want to see as soon as they reach the website. We made sure to design the site to have the following items near the top of the screen: 1) Phone number; 2) Link to the company’s excellent “A” BBB rating; and 3) “Get a Quote” form on the homepage. NDDesign also took over Checker Mover’s Google Adwords campaign. We were able to qualify the company for a Google program that enables us to work directly with a Google Adwords team. The team helped us set up the campaign with Checker’s goals in mind. The result has been a great success, and Checker has been fully booking their schedule weeks in advance.